Yeah, winter training is hard. Its cold, dark, wet, and miserable outside. Our daylight hours are reduced, making it difficult to be safe and get workouts in before and after work. We have to buy expensive winter gear to stay warm, which eats into our holiday funds. Yep, winter training is nothing like the paradise of summer training. Winter training provides a higher foundation heading into the the new racing season. 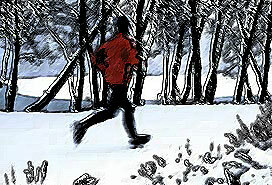 Come March, when your competitors will be dusting off their running shoes, you would have already gained an advantage. Provides an opportunity to train in conditions that are not so perfect. Hey, race day conditions are seldom ideal and getting practice in in less than ideal conditions prepares you for the worst. It’ll provide stress relief during the holidays. With countless social occasions on your calendar, the stress of shopping in crowded stores, squeezing in extra end of the year projects at work, etc, the holidays can stress us all out. Getting a good run, bike, swim in will help relieve the stress. Triathlons are mental events. I know the physical side of triathlons are just a small part of the picture, based on personal experience (I’ve seen very strong athletes crumble during the swim). Getting yourself mentally prepared by running through a blizzard is just part of the journey. It “separates the men from the boys.” Yes, the weak will hang up their running shoes and take a nice comfy arm chair next to the warm fireplace. The strong will be running/swimming/biking in the freezing temperatures. Just think, when you meet that fellow runner by the coffee maker at work one afternoon and their chin drops to the floor when you tell them you ran 6 miles through that icing storm last night, you will be gloating for the rest of the day. What ever reason you use to maintain a proper training schedule during the winter, just know that it is truly worth investing in winter training. Whether your are preparing for a triathlon, an ironman, or a marathon in 2011, get a head start on your competition this winter. This entry was posted in Cycling, Fitness, inspiration, Running, Strength Training, Tips, Trail Running, Triathlon, triathlon training, Uncategorized and tagged 5K, Cycling, exercise, Fitness, Running, Training. Bookmark the permalink. Probably the biggest reason for training during the winter is simply due to burning all the calories we’ll consume.